Interview the customer to obtain as much information as possible about the conditions and environment under which the malfunction occurred. Check the malfunction on the vehicle that the customer describes. Inspect the relation of the symptoms and the condition when the symptoms occur. Use Symptom diagnosis from the symptom inspection result in step 2 and then identify where to start performing the diagnosis based on possible causes and symptoms. Refer to WW-46, "Symptom Table". Perform the diagnosis with Component diagnosis of the applicable system. Repair or replace the specified malfunctioning parts. 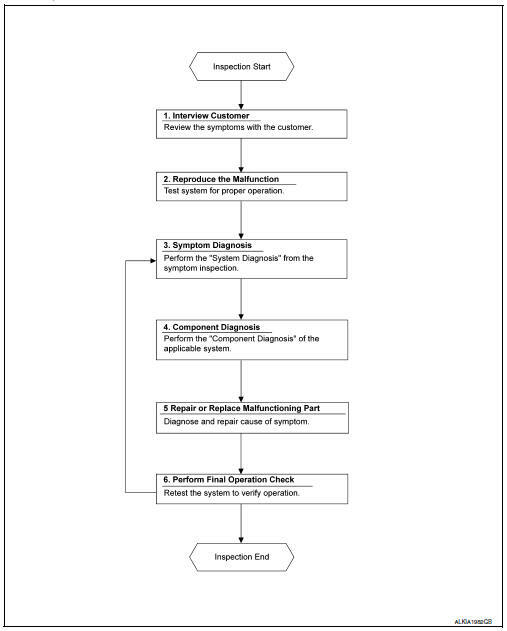 Check that malfunctions are not reproduced when obtaining the malfunction information from the customer, referring to the symptom inspection result in step 2. Are the malfunctions corrected? YES >> Inspection End.